The world knows Mika Waltari as the writer of The Egyptian and some other historical novels that mix adventure, philosophy, occasional overwriting and literary themes. When Waltari published his The Egyptian (originally titled Sinuhe egyptiläinen) in 1945, he had been writing fiction (and drama and poetry and some non-fiction) for exactly 20 years. His first short stories came out in an otherwise forgotten magazine called Juttutupa/Story Shackle in 1925. He published short stories under the pseudonym Karl Detmold (it was sometimes typeset wrong, for example as Kaarlo Detmold). Some of the stories are already in the horror mold, some of them are pure adventure, while some are whimsy love stories. He wrote in his memoir that the publisher of Juttutupa paid better for the love stories. In 1926, he published a collection of short stories under the byline of Kristian Korppi. He'd used the nom de plume also on some poetry he'd published in a collection of young poets, and he would use it for a year or two in short stories he wrote for the fictionmags of the time. It translates as "Christian Raven" and shows a direct Poe influence. 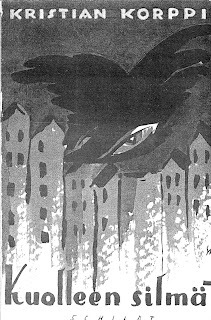 The collection is titled The Dead Man's Eyes, with the subtitle Stories From the Threshold of the Unknown, and in the book there are eleven stories some of which are quite readable even today - though Waltari later said he hoped the book would remain forgotten, and it remains unreprinted, save for three stories. Those three stories are the best in the bunch. "Auringonlaskun saari" has even come out in English - in the book Johanna Sinisalo edited in 2005, The Dedalus Book of Finnish Fantasy. "The Isle of Setting Sun" could've very well been published in Weird Tales or Adventure or some other pulp magazine of the period, and it might be reminiscent of, say, Clark Ashton Smith, if it were not for the fact that it precedes Smith's work by some years. Waltari's story is strong sword and sorcery, with fantastic overtones. The other two stories that have been reprinted are "Muumio/The Mummy" and "Punainen kolmio/The Red Triangle". The former one is pretty standard fare, but still effective story-telling about a curse of a mummy a Finnish archeologist finds in Egypt. "The Red Triangle" is much stronger: it tells a story of a young student who buys a skull and a dagger from an auction and finds himself getting drawn into a mystery that involves a beautiful woman. The story is ripe with S/M eroticism, with the young student fantasizing about decapitated heads. Other stories in the book are more standard. The most horrific is "Kirotut silmät/The Cursed Eyes" in which the protagonist drowns a newborn baby in a bog and afterwards chops the mother by axe. In a manner reminiscent of Poe, the protagonist narrates his own story with a maniacal tone. Also adventurous is "Oopiumihoure/The Opium Dream" in which a strange man tells about his adventures in India, becoming a yogi and then falling in love with a beautiful woman... "Mustat orkideat/The Black Orchids" features a huge black dog, which seems to possess mysterious forces - this might also be the work of Lovecraft ("The Hound", 1924), but it also brings The Hound of the Baskervilles into mind. As I said, only three stories of the bunch have been reprinted in Finnish (in a book called Lukittu laatikko ja muita kertomuksia/The Closed Box and Other Stories), but I don't see why the whole book has to remain unread. Some of the stories could've been written by many American or English authors, and in comparison Waltari has nothing to be ashamed of. It has also been commented on as a rare entry in horror in the annals of Finnish literature, but even a quick look at some of the fiction mags of the 1920's reveals that there was lots of horror being written in Finnish. Some of the stuff made its way into books. Well, Juri, feel up to seeking rights to translate some into English? Todd, that's a brilliant idea, but Waltari's daughter won't give away the rights. I don't think Sinisalo's anthology would have "The Isle of Setting Sun", had it not been reprinted while Mika Waltari was still alive. The sad truth is that if these were written by an American or British author, all of them would've been reprinted and also used in various anthologies.